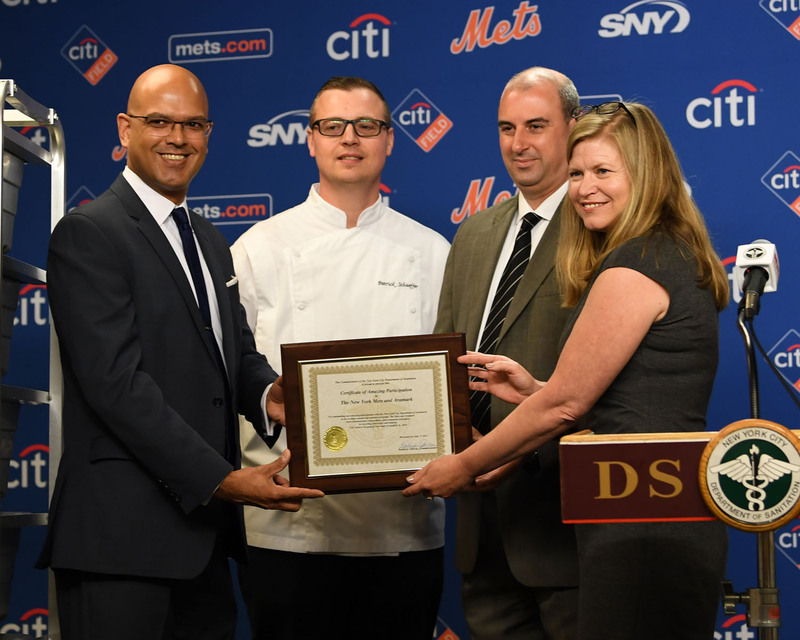 Aramark, Citi Field's food and beverage provider, and the New York Mets have been recognized by the New York City Department of Sanitation with a "Certificate of Amazing Participation" for their continuous support and exemplary commitment to their organics program. 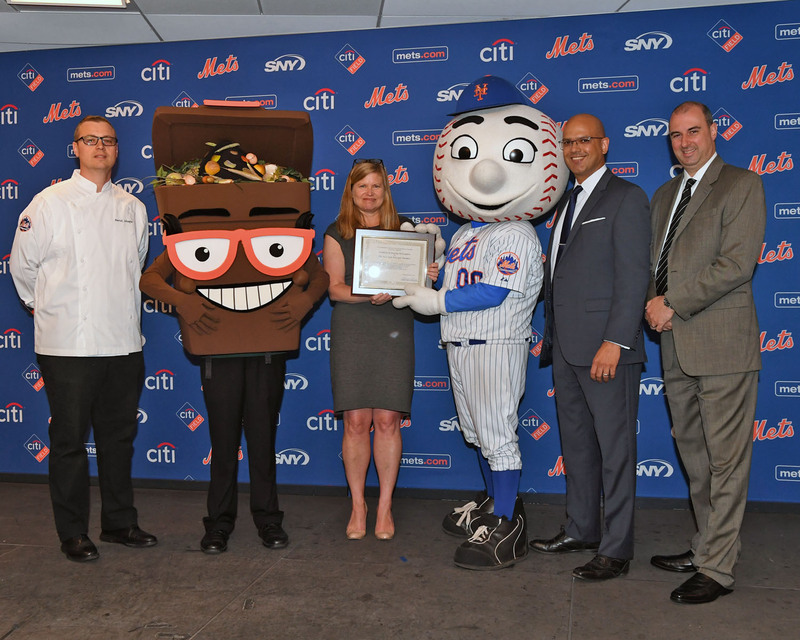 “The New York Mets together with Aramark are thrilled to be doing our part in reducing the incredible amount of waste that currently goes to landfills every day. It takes strong teamwork to improve our environment and we, along with our fans, are proud to step up and encourage others to join us," said the Mets organization . Food scraps and other organic waste make up more than one-third of all commercial waste. Diverting this material from landfills means it can be used as a natural soil amendment through composting or clean, renewable energy through anaerobic digestion. Keeping food scraps and other organic waste out of landfills also reduces the emissions of methane gas, a harmful greenhouse gas and major contributor to climate change. Across Aramark operations, we’ve implemented practices that decrease the impact – and the cost – of waste, as part of our Green Thread , our environmental sustainability platform. Starting with what we purchase, and continuing through to how we dispose of waste, we work hard every day to reduce our environmental footprint. As a global food service company, we're proud to be recognized by the U.S. Environmental Protection Agency (EPA) and the U.S. Department of Agriculture (USDA) as a Food Loss and Waste 2030 Champion for our commitment to reduce food loss and waste in our operations by 50 percent by 2030. Our approach to managing food waste is aligned with the EPA’s food recovery hierarchy, and with our “behind the scenes” food management programs, we make sure we are ordering accurate amounts of food, preparing and serving it in a way that limits waste, and tracking our progress. Sometimes unique circumstances, like an event cancelled at the last minute, or an unexpected snow storm that closes dining facilities, causes us to make other plans. In those cases, we implement our food donation program to provide safe, unserved food to hunger relief agencies in our communities. We partner with our clients to create robust recycling and composting programs to keep waste out of landfills. We also offer them solutions that help reduce waste at the source – like reusable to-go food and beverage containers, and “trayless” dining programs, which are proven to cut down on the amount waste created.